Since VW started building a U.S. version of the Passat in Chattanooga in 2011, the share of imported vehicles in its model range has been dropping. FRANKFURT -- Even while benefiting from a weak euro, Volkswagen Group won't try to boost the VW brand's U.S. market share by cutting prices, a senior group executive said earlier this week. "We do not see major changes needed in terms of our pricing strategy," Christian Klingler, Volkswagen Group's board member for marketing and sales, told analysts earlier this week after the announcement of first quarter results. He said VW would rather sacrifice share than put more money on the hood. 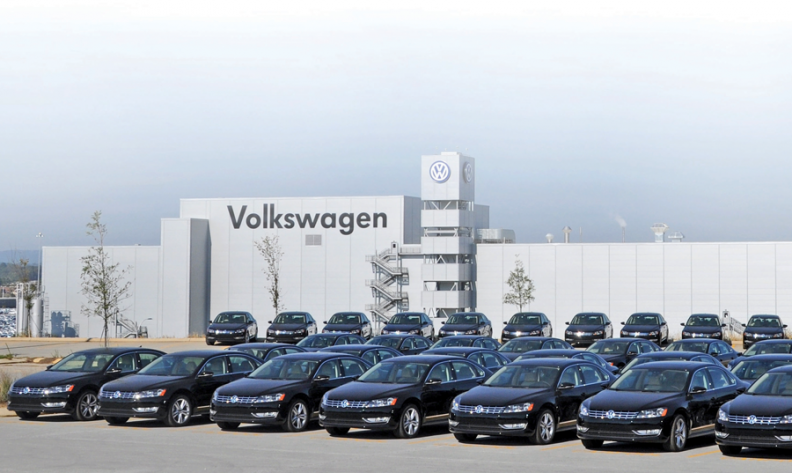 On Friday, VW said its brand sales in the U.S. fell 2.7 percent in April to 30,009 vehicles. Year-to-date sales fell 7.5 percent 109,248 vehicles. The overall U.S. market rose 4.6 percent in April and is up 5.4 percent for the first four months of the year. Klingler said the brand also was following this long-term approach of protecting margins or limiting losses as much as possible in other countries where it is having difficulty, such as Brazil. "We believe it's the right strategy over the long term," he said. Global profitability for the VW brand improved marginally year on year -- to 2.0 percent from 1.8 percent in the first quarter of 2014. Klingler said VW's ability to take advantage of the weak euro no longer was all that significant. "It is true that exchange rate has an impact," he said, "but we have a big part of the volume of our cars coming directly from the North American market, and as a consequence, volumewise, this impact is not extremely strong." According to Edmunds.com, incentives per VW brand vehicle declined from $3,132 in May to $1,840 in January. In February, the most recent month for which data are available, incentive spending for the VW brand rose to nearly $2,200 per vehicle but remained about 6.5 percent below the industry average. Since VW started building a U.S. version of the Passat in Chattanooga in 2011, the share of imported vehicles in its model range has been dropping. Last year, only about 46,000 VW brand vehicles were built in Europe and sold in the U.S., less than 13 percent of overall volume. Klingler reaffirmed his forecast that U.S. sales for the brand would be "roughly on the same level" as in 2014, when volumes fell just shy of 367,000 vehicles, a 10 percent decline from 2013.